Cozy up with a Book at the Historic Raritan Library ~ The History Girl! I have always loved libraries - I could spend hours getting lost in a book. Now to imagine getting lost in a book at the Raritan Public Library, which happens to be housed in the historic General John Frelinghuysen House, built in stages between the early 1700s and 1810. Not only is it historic and cozy, it is welcoming and well-appointed, making it feel like home. The land on which the library is located was purchased by Dutch settlers in 1693. One of the earliest recorded owners is Cornelius Middaugh. It is believed that he may have constructed the west wing of the building, a one-and-a-half story frame structure at some point in the early 1700s. Based upon research conducted by the library, this section may have been used as a tavern, public meeting hall, and a jail. The brick section of the structure (to the left of the framed wing) dates to the period of 1740-1780 based on architectural evidence, but its builder is uncertain. It may have been constructed by either Cornelius Middaugh or the home's second owner, Colonel Frederick Frelinghuysen. The brick walls of the home were constructed in Flemish bond. It is five bays wide with a center hall and was originally only one full story in height with an attic area. Colonel Frederick Frelinghuysen purchased the property from Middaugh in the second half of the eighteenth century. Frelinghuysen was born near Somerville on April 13, 1753 to John Frelinghuysen of Flatbush, Brooklyn and Dinah Van Berg of Amsterdam. Frederick's father was the son of the controversial Dutch Reformed minister Theodorus Jacobus Frelinghuysen, who is known for his unconventional practices at the Church of the Three Mile Run that stood on the border of present-day New Brunswick and Franklin Township along Route 27. Theodorus was a proponent of establishing a college in the area and after his death, his sons Reverend Theodorus Frelinghuysen and Reverend John Frelinghuysen helped to establish Queen's College in New Brunswick, now Rutgers University. Frederick graduated from the College of New Jersey (now Princeton University) in 1770. He was admitted to the bar in 1774. During the Revolutionary War, he became an officer and served as a member of the Provincial Congress of New Jersey from 1775 to 1776. Among his many political duties and accomplishments, he was elected as United States Senator from New Jersey and served from 1793 until 1796, and also served as the United States Attorney for the District of New Jersey in 1801. He married Gertrude Schenck and had five children. Frederick died in 1804 at the age of fifty-one and the house was inherited by his eldest son, General John Frederick Frelinghuysen. The children's section of the Raritan Public Library, located in the original portion of the home. John Frederick Frelinghuysen was born in Millstone, New Jersey on March 21, 1776. John graduated from Queen's College (now Rutgers University) in 1792 after studying law, and he was admitted to the bar in the state of New Jersey in 1797. That same year, he married his first wife, Louisa Mercer (who passed away in 1809) and had two children. He remarried to Elizabeth Mercereau Van Vechten in 1811 and together they had eight children. During the War of 1812, he commanded the New Jersey State Militia at Sandy Hook, where his assignment was to prevent ships from attacking New York City. At the close of the war, he was promoted to brigadier general. Two years prior to serving in the military, about 1810, John enlarged the house by raising the roof to create a full second story on the main masonry block of the home and remodeled it in the then-popular Federal style. John Frederick Frelinghuysen died April 10, 1833 and two of his daughters, Sarah and Katherine, continued to live in the house. In 1850, a neo-classical portico with four Doric fluted columns was added to the front of the home. The four columns represent Equality, Liberty, Freedom, and Law. Around the same time, a two-story framed rear ell was added. In 1924, David Glaser purchased the property and constructed additional rooms to the rear of the house. 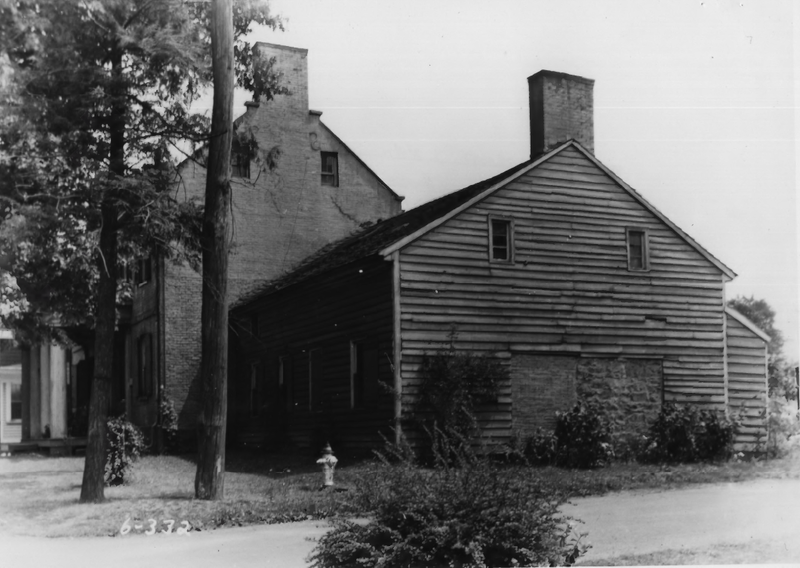 In 1970, the family homestead returned to a Frelinghuysen. This time, Peter H.B. Frelinghuysen, a former NJ Congressman, purchases the home and property for $30,000 from the Glaser family and donated it to the Borough of Raritan for public use as a library and museum. Renovations begin in the early 1970s to transform this home into a library. The rear wings added to the home in 1850 and 1924 were removed during renovations in 1974. These wood frame sections were not as well-built as the other sections of the home and had become badly deteriorated by the mid-twentieth century. A brick addition at the rear of the building would be constructed in its place. In the original sections of the home, the rooms were delicately restored to their former grandeur, so as to blend a modern library with the historic home. Each room features beautiful mantles, wood floors, and the earliest section of the home has the original hearth and bake oven and low exposed ceiling beams visible, making for an extremely unique and visually charming library setting. On the second floor of the library is a room dedicated to local resident, Gunnery Sgt. John Basilone. Basilone was killed in action on the first day of the Battle of Iwo Jima. He grew up in Raritan Borough and served three years in the United States Army with duty in the Philippines before joining the United States Marine Corps in 1940. He fought in the Battle of Guadalcanal during World War II where he held off 3,000 Japanese troops after his unit was reduced to himself and two other Marines. He was awarded the Medal of Honor for his actions at Guadalcanal. He was the only enlisted Marine in World War II to receive the Medal of Honor and the Navy Cross. On September 21, 1943, Raritan gave Basilone a Welcome Home Parade to honor him. An annual parade is held in his honor each September. The room features many artifacts from Basilone, including photos, newspaper clippings, memorabilia, and books.